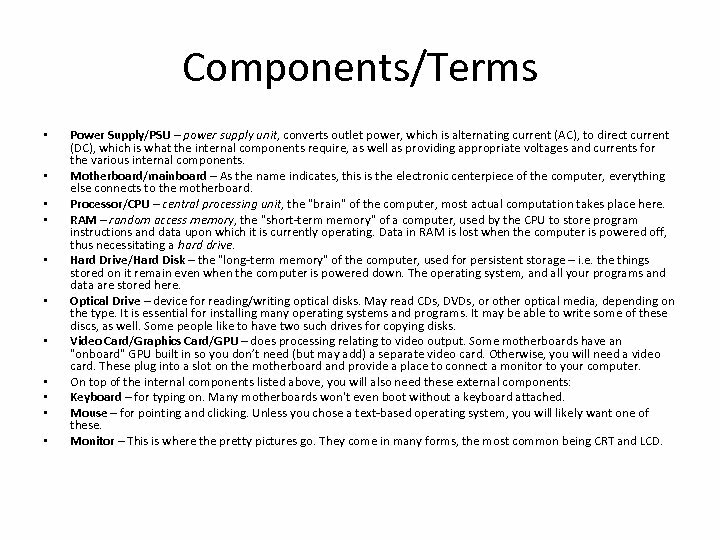 Objectives • To create my very own personal computer • Understand the components of every mechanism that makes a computer run • Understand the history of computers and get a better insight on the future of computers. 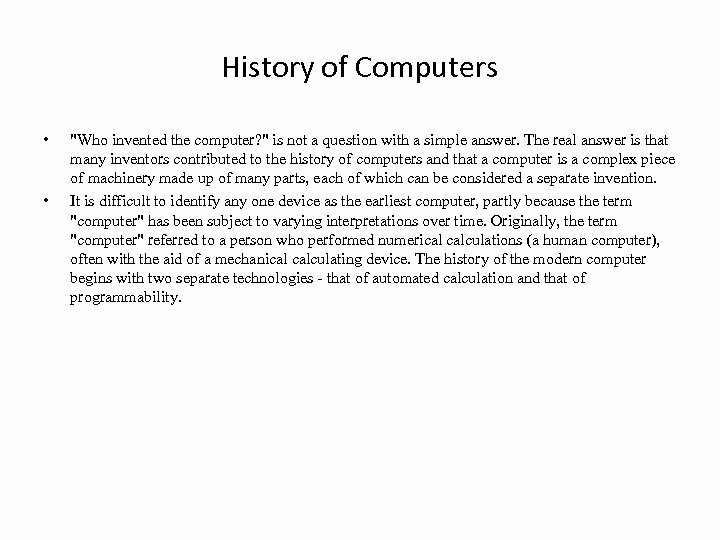 History of Computers • • "Who invented the computer? " is not a question with a simple answer. 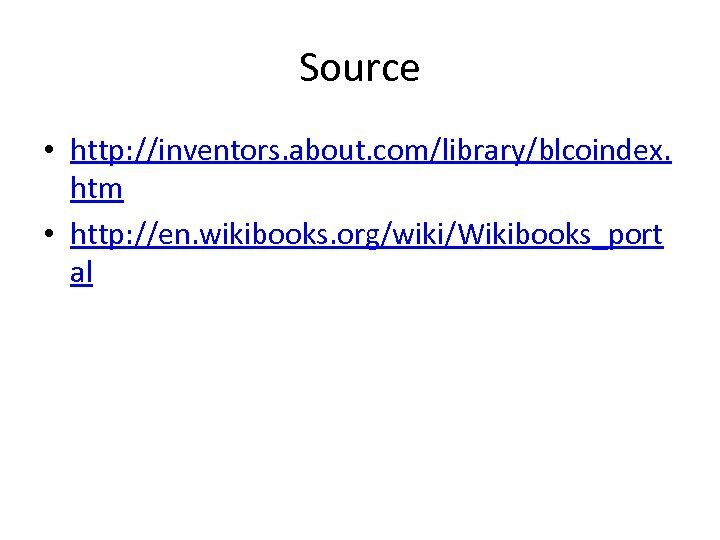 The real answer is that many inventors contributed to the history of computers and that a computer is a complex piece of machinery made up of many parts, each of which can be considered a separate invention. It is difficult to identify any one device as the earliest computer, partly because the term "computer" has been subject to varying interpretations over time. Originally, the term "computer" referred to a person who performed numerical calculations (a human computer), often with the aid of a mechanical calculating device. The history of the modern computer begins with two separate technologies - that of automated calculation and that of programmability. 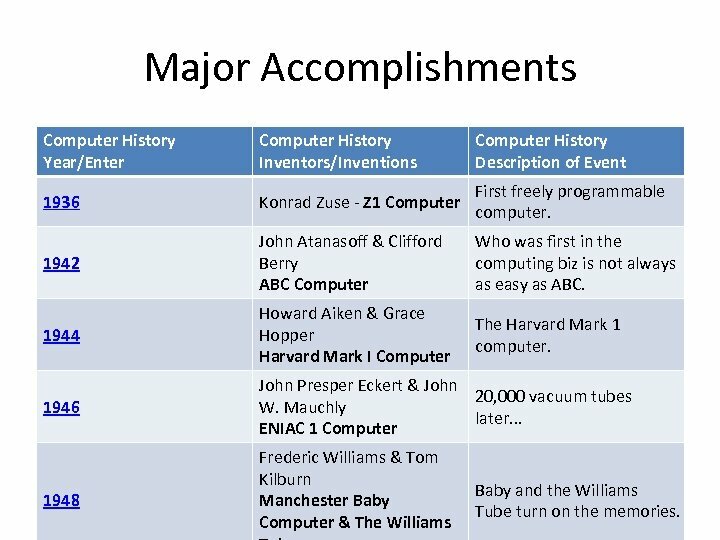 Major Accomplishments Computer History Year/Enter Computer History Inventors/Inventions Computer History Description of Event 1936 Konrad Zuse - Z 1 Computer First freely programmable computer. 1942 John Atanasoff & Clifford Berry ABC Computer Who was first in the computing biz is not always as easy as ABC. 1944 Howard Aiken & Grace Hopper Harvard Mark I Computer The Harvard Mark 1 computer. 1946 John Presper Eckert & John 20, 000 vacuum tubes W. Mauchly later. . . ENIAC 1 Computer 1948 Frederic Williams & Tom Kilburn Manchester Baby Computer & The Williams Baby and the Williams Tube turn on the memories. 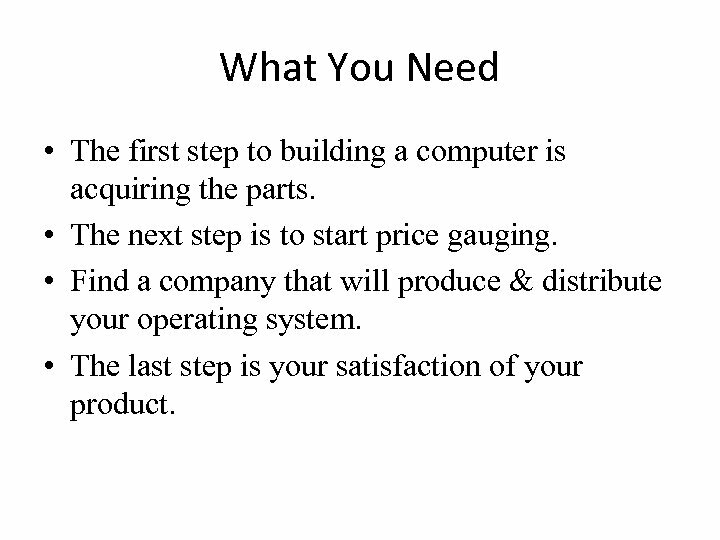 What You Need • The first step to building a computer is acquiring the parts. • The next step is to start price gauging. • Find a company that will produce & distribute your operating system. • The last step is your satisfaction of your product. Components/Terms • • • Power Supply/PSU – power supply unit, converts outlet power, which is alternating current (AC), to direct current (DC), which is what the internal components require, as well as providing appropriate voltages and currents for the various internal components. Motherboard/mainboard – As the name indicates, this is the electronic centerpiece of the computer, everything else connects to the motherboard. Processor/CPU – central processing unit, the "brain" of the computer, most actual computation takes place here. RAM – random access memory, the "short-term memory" of a computer, used by the CPU to store program instructions and data upon which it is currently operating. Data in RAM is lost when the computer is powered off, thus necessitating a hard drive. Hard Drive/Hard Disk – the "long-term memory" of the computer, used for persistent storage – i. e. the things stored on it remain even when the computer is powered down. The operating system, and all your programs and data are stored here. Optical Drive – device for reading/writing optical disks. May read CDs, DVDs, or other optical media, depending on the type. It is essential for installing many operating systems and programs. It may be able to write some of these discs, as well. Some people like to have two such drives for copying disks. Video Card/Graphics Card/GPU – does processing relating to video output. Some motherboards have an "onboard" GPU built in so you don’t need (but may add) a separate video card. Otherwise, you will need a video card. These plug into a slot on the motherboard and provide a place to connect a monitor to your computer. On top of the internal components listed above, you will also need these external components: Keyboard – for typing on. Many motherboards won't even boot without a keyboard attached. Mouse – for pointing and clicking. Unless you chose a text-based operating system, you will likely want one of these. Monitor – This is where the pretty pictures go. They come in many forms, the most common being CRT and LCD.